The hard-fought election brought minimal changes to most state offices, with another two years of split-party control of the state House and Senate. But the election of Donald Trump as president is likely to turn health care on its head. What’s coming from the Trump administration related to the repeal and replacement of the Affordable Care Act (ACA) may be the single biggest focus of the session. At this point, uncertainty reigns. Congressional Republicans are eager to get rid of the individual mandate to purchase insurance, place a greater focus on personal responsibility and make sweeping changes to publicly funded programs, especially Medicaid. Plans from U.S. Speaker of the House Paul Ryan, incoming Health and Human Services Secretary Tom Price and others have been heavily scrutinized since the election for clues as to what might be coming — and what it will mean for states such as Colorado that were enthusiastic adopters of ACA programs. Republican plans cover fewer people than the ACA currently does. They are generally better for people who are young, healthy, and higher-income and worse for those who are older, sicker, and lower-income. They will likely lower premiums and cover fewer benefits. As federal direction becomes clearer, Colorado legislators will have important decisions to make in response. Will the federal government continue to pay almost all the cost of Medicaid expansion? If not, how would Colorado afford to keep covering its population? And what should legislators do with Connect for Health Colorado, the state insurance exchange, if the ACA’s mandates and subsidies are repealed? State-level issues offer a bit more predictability. With Republicans controlling the Senate and Democrats the House, around half of introduced bills will probably succeed in 2017, and we expect to see plenty of “statement bills” — those that deal with partisan issues and are introduced largely to send a message about the priorities of the sponsors or their party. Legislators have serious health policy issues to tackle this year. They will craft a state budget in another challenging fiscal environment. Conversations about Medicaid are sure to figure in budget planning and in broader debates about coverage and access. Insurance carriers may be up against the ropes as providers and consumers make their voices heard about rising premiums and unexpected bills. And attempts will continue to improve transparency around topics such as freestanding emergency departments, prescription drug costs and background checks for health care providers. The issues may be wonky, but we expect the debate to be emotional. At its heart is the question of whether health care is a fundamental right guaranteed by government or a personal responsibility within a free marketplace. If legislators can achieve a compromise between these two viewpoints, then the 71st General Assembly will have ample opportunities to leave its mark on Colorado’s health care system. 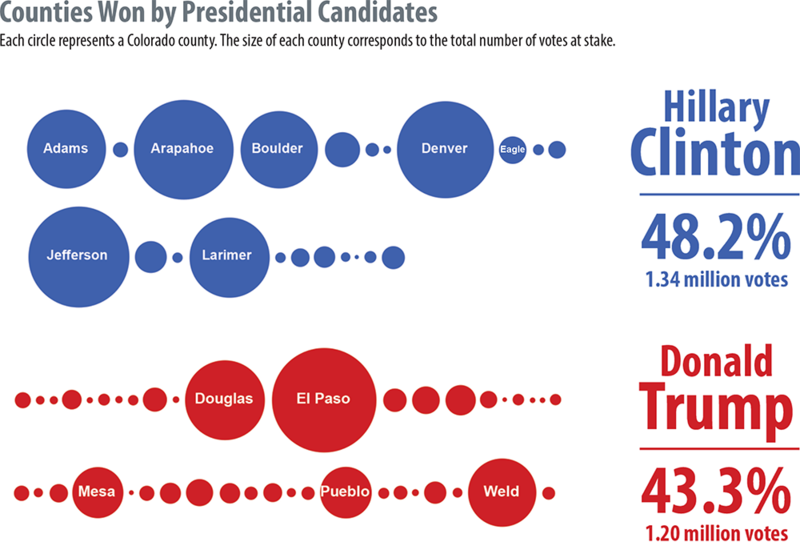 Going into the November election, Colorado was one of the most narrowly split states in the country, with a Democratic governor, one Republican and one Democratic U.S. senator, and four Republican and three Democratic U.S. representatives. Each party controlled one chamber of the state legislature. The election preserved that makeup and affirmed Colorado’s “purple” status. Incumbents won all seven U.S. House races and the U.S. Senate race. Republicans maintained control of the state Senate due to a few key contests, and Democrats kept the House. Hillary Clinton prevailed in Colorado by winning most of its populous areas. Donald Trump won wide swaths of rural Colorado. Notably, nearly nine percent of Colorado voters rejected the two major-party nominees, selecting either a third-party candidate or leaving their presidential ballots blank. This proportion was nearly three times higher than in 2012, with a quarter million Colorado voters deciding they weren’t buying what either party was selling with Clinton and Trump. At the state government level, Democrats won in many parts of the Front Range and metro Denver, plus the mountain resort counties and part of the San Luis Valley. Republicans won just about everywhere else. The maps of Colorado’s state legislative districts (see Page 6) show a bit of blue in a sea of red, but it’s clear that the state is very balanced politically. Referring to Colorado as “blue” after the presidential vote is overly simplistic. When the dust settled after the 2016 election, Republicans had held on to their one-seat majority in the Senate while Democrats padded their control of the House by an additional three seats. The party numbers did not change much from 2015 and 2016, but the General Assembly will include many new faces. Colorado’s economy is robust by many measures, including an unemployment rate that is among the lowest in the country. But the state budget is tight. Legislative economists forecast a challenging year given declines in tax growth, the oil and gas downturn and other factors. Fights will continue over the Taxpayer’s Bill of Rights, or TABOR, which requires tax refunds when state revenue grows faster than inflation and population. Major demands on the General Fund include new Medicaid costs, growing K-12 enrollment, refilling the budget reserve and issuing a $257 million TABOR rebate. (The TABOR projection increased substantially from Gov. John Hickenlooper’s November budget proposal to Legislative Council’s December revenue forecast.) In total, the state anticipates a funding shortfall of more than $500 million for fiscal year (FY) 2017-18. At the center of the budget debate is the Hospital Provider Fee, which counts toward the TABOR limit even though most of the money passes through the state budget on its way to hospitals. A proposal to remove Provider Fee revenue from TABOR failed in the Senate in 2016. Hickenlooper warned in his latest budget request letter that TABOR will prevent the state from meeting its needs in the coming year. He pointed out that “in FY 2017-18, without the [Provider Fee] included in revenues that count towards the limit, state revenue is expected to be $689.9 million below inflation and population growth,” or safely below the cap that triggers taxpayer refunds. But incoming Republican Senate President Kevin Grantham, who will control the fate of any Provider Fee bill, has already said that he has “very little interest” in reviving the 2016 proposal. Most Republicans defend TABOR and dismiss the Provider Fee proposal as a “sleight of hand” or a distraction from bigger budget issues. If the fee is not exempted from TABOR, Hickenlooper’s team recommends repeating a budget move from last year: cutting the amount of the Provider Fee to get the state below the TABOR revenue limit. Hospitals will lobby for a different solution, because they would lose out on tens of millions of dollars in federal matching funds. In a twist to this year’s debate, Sen. Larry Crowder and Rep. Dan Thurlow have proposed changing TABOR’s formula to limit revenue based on personal income growth, instead of inflation and population. This would raise the TABOR limit, and it will be a controversial idea among the pair’s fellow Republicans. Two new members have joined the bipartisan, six-member Joint Budget Committee, which writes the state budget each year. Republican Sen. Kevin Lundberg and Democratic Sen. Dominick Moreno bring very different views to the committee. Expect an increased focus on state health care spending from Lundberg, the former chair of the Senate Health and Human Services Committee and a vocal critic of Medicaid costs and the state health insurance exchange. Moreno has not been deeply involved in health care debates, but is likely to counter many of Lundberg’s views. What's All This Talk About Block Grants? The debate over Medicaid at the federal level could have a big impact in Colorado. More than 1.3 million people are enrolled in the program — nearly one of four Coloradans. Almost half a million gained Medicaid coverage under the ACA’s eligibility expansion. Republicans at the national level have proposed changes to the Medicaid program that could be budget busters for Colorado. Speaker Ryan’s “Better Way” plan offers states a per capita allotment or a block grant in place of the current Medicaid funding structure. This would be a major departure from a funding model in which the federal government pays a percentage of Medicaid costs in each state. In Colorado, the feds pick up more than 90 percent of the tab for the expansion population and 50 percent for other enrollees. Per capita allotments would be based on historical spending for groups of enrollees, such as kids or childless adults. The state would receive a distinct allotment to spend on each group. States could get more money if more people signed up, but could only spend the funds on the populations for which they were intended. In other words, federal dollars meant to cover kids on Medicaid could not be used for other groups, such as people with disabilities. Block grants are a similar concept, but they offer even more spending flexibility. These lump sums from the federal government would come without many restrictions, allowing states to direct funds as they chose. If a state saw more people enroll in the program than anticipated, the amount of its block grant would not increase. And if it had fewer people enroll or saw lower costs, it could keep the extra money. But changes at the federal level could put the state on the hook for much more than it has been planning to spend on Medicaid. If the ACA replacement plan involves per capita allotments, block grants or cutting the federal match rate for the expansion population, the state would have to decide if it wants to maintain Medicaid coverage for hundreds of thousands of people — and, if so, how to pay for it. Many proposals that were killed last year are likely to rise from the dead, either in an identical form or in a reworked version. Freestanding EDs have been popping up around Colorado, especially in higher-income areas. Some Coloradans visit these facilities for treatment thinking that they’ll be charged as if they were at an urgent care facility, but sticker shock sets in when they get the bill. Critics have called for limiting the growth of freestanding EDs around the state, through a Certificate of Need law or other means, or at least ensuring that consumers understand the higher costs at these facilities. A 2016 bill (HB 16-1374) designed to educate consumers about the difference between freestanding EDs and urgent care failed due to concern over conflicts with a federal law. Democratic Sen. John Kefalas convened a group to study the issue in the interim and will be sponsoring a bill. It’s possible that there will be proposals to limit the growth of hospitals, too. As soon as the bill to remove Provider Fee revenue from the TABOR limit (HB 16-1420) failed last session, Democrats vowed to bring it back. But their chances would have been much better if they’d gained control of the Senate. While an effort to change the fee’s TABOR status is guaranteed to attract a lot of attention in 2017, its chances are slim unless new coalitions pressure leadership or new compromises are put on the table. A proposal to require greater transparency in pharmaceutical pricing (HB 16-1102) failed last session after it was opposed by the pharmaceutical industry, which said it went too far, and by advocates who believed it did not go far enough. Expect another try for this bill, which sought to require manufacturers to disclose their costs and pricing structure for certain expensive medications. Getting treatment outside of the insurance company’s provider network can result in a not-so-pleasant surprise bill. It has been two years since the last measure (SB 15-259) attempting to deal explicitly with this topic, but the debate has been ongoing. The upcoming session will see an attempt to eliminate so-called balance billing — where patients are billed for the difference between what their providers charge and what their insurance pays — and may feature other bills designed to clarify in- versus out-of-network providers for consumers in advance of receiving services. Insurance premiums are on the rise, and the cost for some Coloradans, especially those in the mountain counties, is nearing the breaking point. The Division of Insurance (DOI) in September announced premiums for 2017, and the news for many was not good. While small group premiums are rising an average of just two percent, plans on the individual market are increasing more than 20 percent statewide. The Eastern Plains and the Western Slope, where consumers already pay some of the nation’s highest premiums, will be hit especially hard. Eastern Plains prices will increase 39 percent from 2016 and Western Slope prices will head up by 28 percent. And 14 counties are down to a single insurance carrier offering plans this year through Connect for Health Colorado. Last session, legislators required the DOI to study the idea of changing the state from nine geographic rating regions — which affect how much carriers can charge people in different parts of the state — into just one (HB 16-1336). The DOI did not recommend the move, because lower prices for some would lead to higher prices for others and because the change could hurt consumers by causing carriers to drop out of the market. The results of the study were frustrating for those desperate for a change. In the aftermath of the DOI’s decision, Lt. Gov. Donna Lynne convened a stakeholder group on health costs that met several times last fall. Four mountain-area legislators helped lead the discussion, which also included county commissioners, insurers and hospital representatives. The group looked at a range of ideas, including some that have long been considered off-limits for Colorado, such as hospital rate setting (which gives a state power over the prices hospitals can charge). Other ideas had been recommended before, such as geographic rate banding, which would limit disparities in premium pricing and represent a middle-ground approach between the state’s current rating regions and a single rating area. Expect to see several bills or at least further research from this group — for example, a proposal to offer subsidies to people with higher incomes (400 percent to 500 percent of the federal poverty level) than what’s allowed by the ACA. It’s difficult to predict what might happen, however, because of uncertainty over changes at the federal level. Many ideas may be sidelined as legislators and the lieutenant governor take a “wait and see” approach. Insurers are being targeted by other groups as well. The legislature may consider bills requiring clearer rules on provider networks, prohibiting insurers from delaying payments to providers and allowing the DOI to investigate large-scale physician complaints (not just those from consumers). Plenty of other health-related issues will emerge this session. A committee chaired by term-limited Democratic Rep. Dianne Primavera met during the interim to discuss letters from HCPF that confused some Medicaid enrollees. This was spurred largely by consumer testimony to the Health Insurance Exchange Oversight Committee in 2016. The committee will introduce several bills recommending changes to improve the clarity of Medicaid communications. Last year, legislators showed strong support for increasing background checks and regulations for surgical technicians after a tech at Swedish Medical Center was caught stealing intravenous painkillers and possibly exposing patients to a bloodborne illness. Building on that bipartisan support, a bill will seek to broaden background checks to apply to any health care providers seeking to renew their license. Colorado’s learning curve with legal marijuana continues. In his FY 2017-18 budget request, Hickenlooper called for an enforcement program for gray market marijuana. It’s safe to say this isn’t the only pot-related measure we’ll see during the session. Some legislators want consumer-friendly changes to the way insurance companies pay for prescription drugs. One proposal could address “medication switching,” where consumers are affected by insurers’ decisions to stop covering certain drugs. Another may focus on “step therapy,” where insurers require people to go through several generic versions of a drug before they’re allowed to get the brand-name version they were prescribed. Although telehealth was discussed during the 2016 session, there have been no bills specifically addressing this delivery method since landmark legislation (HB 15-1029) passed with strong bipartisan support two years ago. Watch for a proposal requiring greater transparency in telehealth requirements, designed to give in-state providers an edge over out-of-state competition. This list is only the beginning. Many other health topics, from contraceptive choice to rules for restaurant inspections, will be on the docket in 2017. Decisions from the new Trump administration may overshadow many state-level debates next session. A comprehensive replacement for the ACA will likely take time to develop, but the idea of a repeal raises many questions. At this point, it seems like just about everything could be on the table. Repealing the individual and employer mandates, which require most people to purchase insurance or provide it for their employees. Continuing to offer tax credits to purchase insurance, but making them more “portable” and basing them solely on age, not on income. Increasing the age-rating ratio, thereby making insurance cheaper for younger people and more expensive for older people. Privatizing Medicare and offering premium support to offset or pay for enrollees’ coverage. Changing federal Medicaid funding to a per capita allotment or a block grant. For more on these Medicaid proposals, see page 9. Republicans introduced legislation to repeal large parts of the ACA in the U.S. Senate on January 3. More will be known about the insurance market in May, when insurers must submit bids to participate in the state’s marketplace, and in November, when the next open enrollment period begins. So far, Republican leaders have said they will not simultaneously repeal and replace the law but will instead choose to “repeal and delay,” or simply repeal it. A diverse coalition of Colorado business groups and consumer advocates released a letter on January 4 warning against gutting the law without a replacement plan. Establish new system of tax credits for those who buy on the individual market. Credits may be based on age rather than income. Effect will depend on the size of the tax credit. Could improve affordability for those who don’t receive a subsidy (or only qualify for a small subsidy) under the ACA. Keep pre-existing conditions but eliminate the individual mandate. Individual market premiums could increase because of changes to risk selection. Encourage use of high-deductible plans paired with health savings accounts (HSAs). Would be beneficial primarily for those who have enough money to put into an HSA. Could help control overall health care costs, but uncertain in the long run. Give states more flexibility in insurance rating and essential health benefits. Could increase premiums for older/sicker people. Could improve affordability for younger/healthier people and encourage more of them to obtain insurance. May allow for less comprehensive (and therefore less expensive) plans. Look for health care to be top of mind for many legislators after taking a back seat to other issues for the past few years. Just as the novelty of many ACA reforms was starting to wear off, the country seems poised for a major shift with the arrival of the Trump administration. Lawmakers’ debates over issues from freestanding EDs to medication costs could be overshadowed by high-profile conversations about the future of Medicaid, the state insurance exchange and other programs if the ACA is repealed, as promised by the president-elect. The hyper-partisan tone of many political debates will add a challenging dimension to these already complex topics, which affect millions of Coloradans. State legislators will move forward with their own priorities but must wait and see for more direction from Washington.